Paris pets in the Metro...a common sight to be sure. You have to keep your eyes peeled to catch Parisian pets on the bus. But they are very much present, here hopping off the bus. I noticed a slew of bigger dogs this trip - this Lab is leash-free. This Giant Schnauser was quite insistent about going inside. Ah the obscure object of desire - a baguette. During our tour of the marche Bastille, Phyllis pointed out a regular - a big Puli lounging a top his owner's rolls of tablecloths. 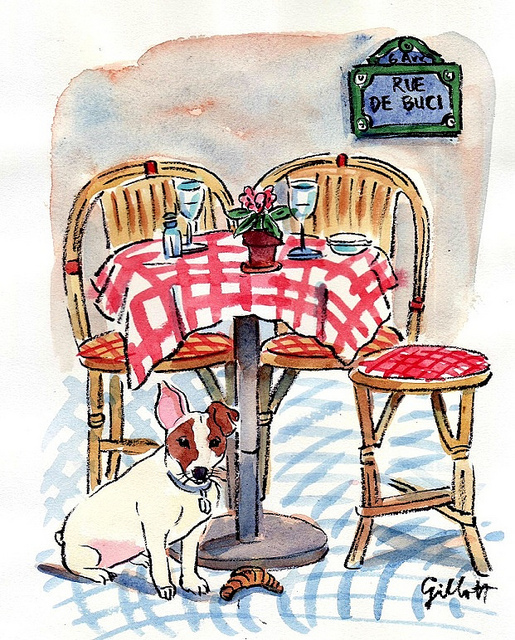 Phyllis promised to let me walk her adorable Jack Russell, Bimba if I move to Paris. This is reason enough to make the move is it not? Dogs in the windows are a common sight in Paris real or otherwise. I was delighted when Ronda asked me to paint her pedigreed chickens at the Tour Eiffel. Marc Jacobs is drawing pets as well - this mural in Galeries Lafayette will amuse. Ben and Kitty are visiting Paris figuratively and virtually. 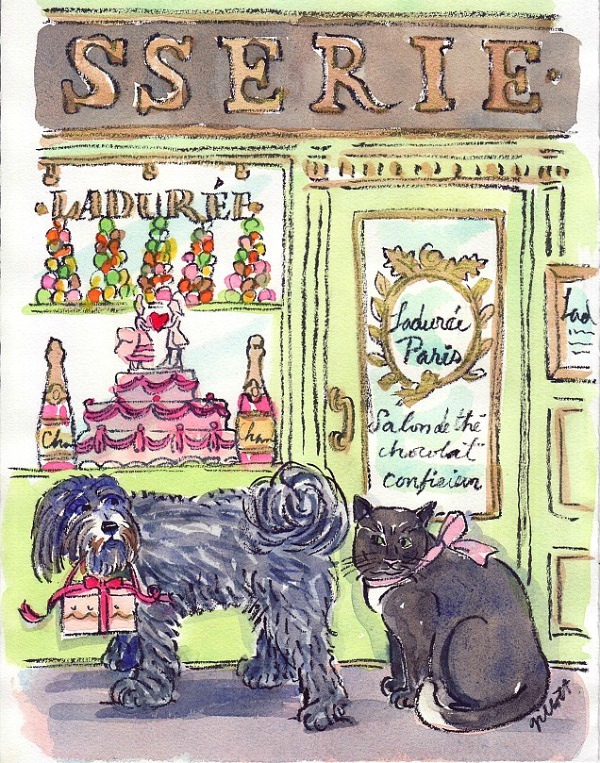 If you have a pet longing to be sent to Paris 'figuratively' do let me know. I'd love to paint them. Unusual pets like lapin, chevre, boas, chickens even mice get a special prix by the way. These are Marc Jacob's mice shoes. My dog, Pancake, would never make it in Paris. He is an American BRAT! Is there a "Bringing up Petit Chien"???? 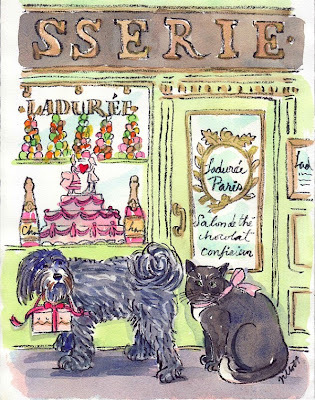 Lovely post, I always count dogs when i'm in Paris. By the way, the lab is a golden! There are lots of dogs leash-free around Paris, much more than there was in Montreal! I don't know why I'm surprised about all the leash-free Parisian dogs. There are so many leash-free kiddies as well. They learn to stick with who brought them somehow or other.. I'm sure they're very well behaved and probably decorate cakes! That must be a first! Chickens at the Eiffel Tower. 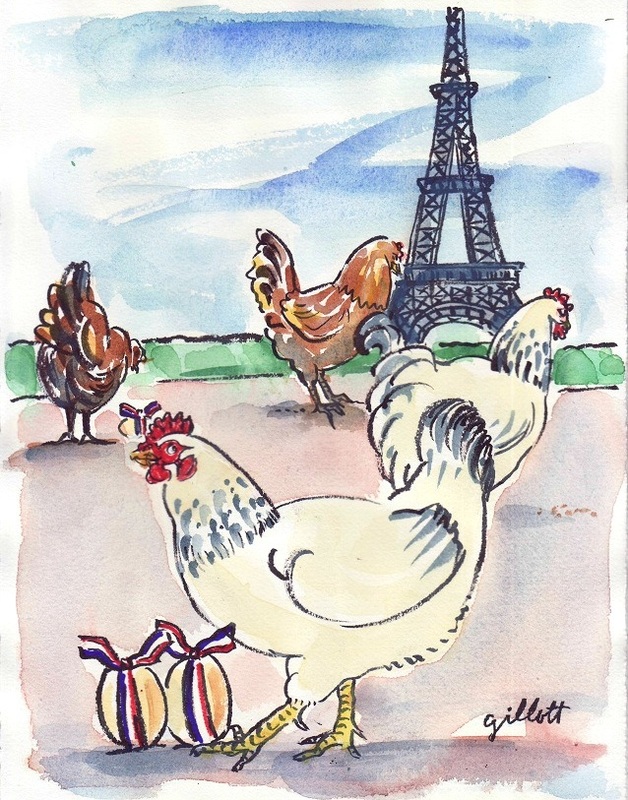 Chickens by the Eiffel Tower - genius! I laughed out loud with delight. And I love the big dogs in Paris! Oh those mice shoes are just too cute. Adorable! Lovely photos and pictures! My favourites in Paris are the little dogs in bags that you don't necessarily notice at first sight, but also love little jack russells like the darling Molly hanging out on Rue de Buci! Fab! I love your paintings, particularly Molly. Quite a treat today with all of your artwork and the doggies! I find the dog/leash sign confusing...it shows a dog ON leash with an red X over it....don't leash your dog??? But the words seem to ask you to leash your dog. So much for the famous French logic! Sorry you're absolutely correct J.
I just liked the graphic. Paris is filled with l'interdite/forbidden signs.. When my chooks peeked at PB today, they got their feathers ruffled over the fact that I had the Goaties & Tibbies Paris portraits done & not theirs! then the Katzs heard them clucking about the unfairness & now they too are snubbing me for the obvious slight! I am putting aside egg $ so I can right this blatant favoritism soon! I love you blogs thank you. I feel like i'm in the Paris that I adore. I think they do more and more. Every new post you make me smile! Merci! I'm not in Paris but my dog Bella is VERY Parisian. She works at my French Cafe full time! Bella is VERY Parisian indeed. Thanks for the link and updates A.